Rob Lowe has always had the ideal American face. It looks plastic, but it’s real. It’s the face of a cherub: a cherub who filmed himself having two separate three-ways (in one of which he wasn’t the only dude) and got away with it, back in the days when things like that were still considered mildly embarrassing. It’s the face Michael Jackson’s surgeons always seemed to be chiselling their way towards. Placed on the cover of an autobiography, Lowe’s face threatens the kind of skin-deep entertainment you get from a Lowe movie. He became a star during the blandest decade in the history of American film, and his performances in those home-made pornos were by no means the most wooden of his career: he was the kind of actor who, in order to portray a tortured saxophone player, simply messed up his hair and walked everywhere with a sax around his neck. 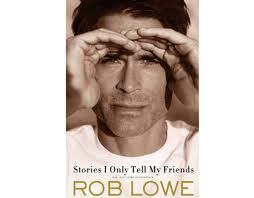 So it’s a bit of a surprise to hear people talking as if Lowe’s autobiography has substance. It’s even more of a surprise to discover they’re not wrong. The blurb writer who hails the book as “a major publishing event” undoubtedly goes a bit far. But Lowe has solid instincts as a memoirist: he knows what sort of things you’ll want to hear, and he’s much more perceptive and thoughtful than you expect someone who looks that good to be. He recounts his early childhood in a series of rapid fades: a shrewd way of fast-forwarding to the showbiz stuff without missing any essentials. His parents separated when he was four – a trauma he evokes with some effect. His teen years in Malibu are packed with cameos from past and future stars. He plays baseball in Martin Sheen’s backyard with Charlie and Emilio; makes home movies with the Penn brothers; dates a girl whose father turns out to be Cary Grant. Come to think of it, Lowe’s account of the film’s making is a lot more interesting than the film itself. He has an excellent memory for detail. His big breakdown scene required him to cry on cue for take after take. He did so. Then the ineffable Francis strolled onto set and announced it was time for the close-ups: Lowe had blown out his ducts on wide shots. After the cast scatters to make other films, Lowe pays a telling visit to Cruise on the set of Risky Business. The old fraternal spirit has waned. “Tom has a new perspective on his acting style, telling me, ‘I want to spend time hanging with you but Joel [his character] doesn’t.” Is Lowe taking a wry jab at the great man here? It seems distinctly possible – unless you’re ready to accept that Tom really needed the Method to help him dance around in his Y-fronts and go toe-to-toe with the guy who played Booger in Revenge of the Nerds. If the whole book had the intensity of the pages about The Outsiders, it would be one of the most interesting actors’ autobiographies of recent times. But Lowe covers nothing else in quite the same detail. Writing about his videotaped ménages, he’s decidedly stingier with behind-the-scenes anecdotes. He does, though, explain how he managed not to notice that one of the female participants was underage. The bar he met her in, you see, had a doorman who was hyper-vigilant about checking IDs. The book gets sketchier as it goes, and there are some strange omissions from its later pages. Lowe never finds room to mention the illness and death of his on-screen brother Swayze. And although he makes frequent mention of his “deep interest” in politics, he never gets around to discussing that interest in any substantial way. Why, for instance, does he prefer Democrats to Republicans? By the time he gets to The West Wing, his big comeback, he seems to be in a distinct hurry. We only get about fifteen pages on it. By the standards of the average showbiz autobiography, that’s quite a bit. But by the standards of Lowe’s earlier chapters, it feels like short weight. There is mention, in the book’s acknowledgements, of a “tight deadline." This explains a lot. But why was it a matter of such urgency to get Lowe’s book out? Couldn’t the publishers have waited till it was ready, or readier? As it stands, it’s not as disposable as most showbiz memoirs, but it leaves you wondering about the even less disposable book it might have been.